Keep in mind that everyone will have a dirty home exterior at some point. When grime, stains, and chemical spills stay on the surfaces of your home, they degrade faster. 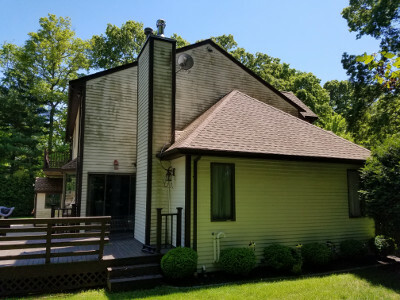 Regular roof cleaning and exterior pressure washing will improve the curb appeal of your Norwell house, fences, patios, and driveway as well as help to keep the materials in good condition. Brick, vinyl, wood siding, decks, and driveways are all surfaces that can weather the elements well but can also end up damaged by harsh cleaning techniques. For all your Norwell roof cleaning and pressure washing service needs, the name to remember is A to Z Softwash. We would love to offer you a quick quote. Why not call today? Part of protecting your roof investment is regular cleaning. Your roof safeguards your home and your family, so it's important to keep it in good condition. Letting debris, stains, and algae or lichen build up on your roof is going to make it look unsightly and will cause damage to the shingles. You will need something that can remove the stains and organisms without destroying the roofing material. High-pressure washing will end up pitting and cracking the shingles to where water gets trapped underneath. In the worst case, the water stream can tear the shingles off the roof or make them loose, leaving part of your roof exposed. Let our soft washing team take care of your Norwell roof cleaning and all will be well. Keeping the fence, deck, driveway, patio, siding, roof, and other exterior surfaces clean is a huge job. The bottom line is that you need an exterior pressure washing service to get this taken care of. We are trained at cleaning all kinds of surfaces well while leaving no damage behind. Our methods of roof cleaning and exterior pressure washing are safe for the materials and the environment. Please feel free to call if you have questions or would like a quote. If you are looking for a Norwell, MA roof cleaning and exterior soft washing expert, then please call 508-209-7795 or complete our online request form.